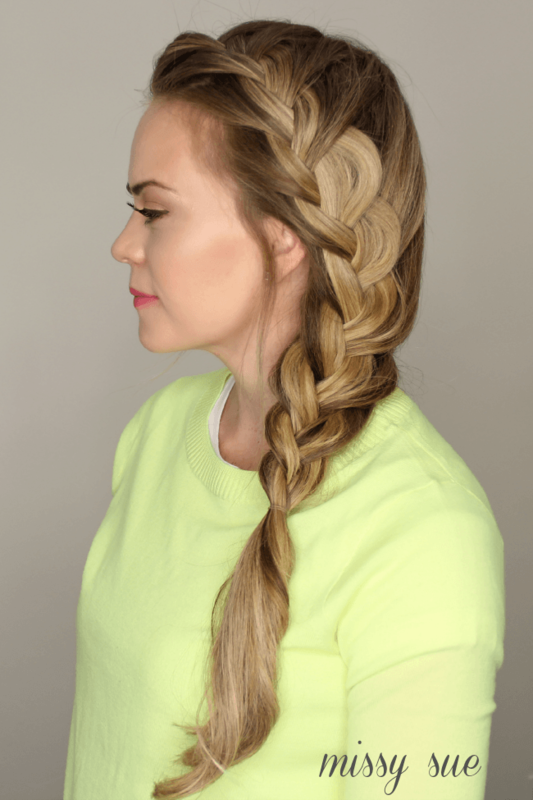 Side French Braid is the newest tutorial for this hairstyle. I have an older version which you can see here but thought it was time to update it. I recently wore this hairstyle and posted the pic on instagram so of course, I have been wanting to create a new tutorial ever since. I hope you enjoy it and be sure and check out the dutch braid version! Begin with a side part on the right side. Take a section of hair on the heavy side of the part and divide it into three smaller pieces. Cross the back strand over the middle. Then cross the front strand over the middle. Cross the back strand over the middle and bring in a section of hair from behind to create the french braid portion. Repeat step 5 with the front strand. Continue braiding down the left side of the face keeping the braid close to the hairline. Pull in hair from the opposite side of the head once the braid reaches about ear level. Continue braiding the hair into a regular braid once all the hair has been pulled in. Stop braiding about halfway to towards the bottom and tie off the braid. Loosen the braid by gently pulling on the edges. Loosen the french braid portion as well by only pulling on the original braid portion and not the pulled in pieces. Pull out any pieces around the face or ears. I’m by no means a professional, and even I was able to get this one to look great on my daughter for our family pics. Thanks for the tutorial! What great tutorials you have Melissa. very beautiful and attractive! I should try it!